NETWORK FINALS: NBC’s STANLEY CUP FINALS game went up 0.2 to 1.4 in final numbers, and CW’s run of the movie MEMORIAL DAY gained 0.1. CABLE HIGHLIGHTS: The official numbers for TNT’s Game 7 of the Western Conference NBA PLAYOFFS confirm what a monster it was with a massive 6.40 rating. TNT appears to have run a sneak episode of the new season of its THE LAST SHIP at 12:25AM, and even that scored 0.76. The simulcast of ROOTS broke down as 0.63 on History, 0.37 on Lifetime, 0.29 on A&E, and 0.15 on Lifetime Movie Network. On MTV, SCREAM made an unimpressive return at 0.22, less than half its 0.45 series premiere (and down 0.12 from the Season 1 finale), and also way down from its 0.73 TEEN MOM lead-in (itself down 0.07 from last week). A SCREAM AFTER DARK after-show was at 0.09. Starz’s original movie THE DRESSER didn’t come close to matching its critical acclaim with ratings, with a pathetic 0.02/109K (the 18-49 number went down to zero for the rebroadcast). VH1’s LOVE & HIP-HOP may have been dented by the NBA game, down 0.28 to 1.15, with BLACK INK CREW DOWN 0.26 to 0.85. USA’s WWE telecast, though, was hardly affected at all, with 1.19/1.19/1.08 compared to last week’s 1.21/1.17/1.07. Discovery’s STREET OUTLAWS edged up 0.02 to 1.08. On TBS, AMERICAN DAD grew by 0.11 to 0.59, and THE DETOUR aired 2 half-hours at 0.41/0.34, compared to last week’s 0.40 for a single episode. On Bravo, SOUTHERN CHARM slipped 0.05 to 0.37, while REAL HOUSEWIVES OF DALLAS gained 0.03 to 0.33. HGTV’s HOUSE HUNTERS was up 0.03 to 0.35, HOUSE HUNTERS INTL was at 0.34, and TINY HOUSE BIG LIVING climbed 0.04 to 0.36. 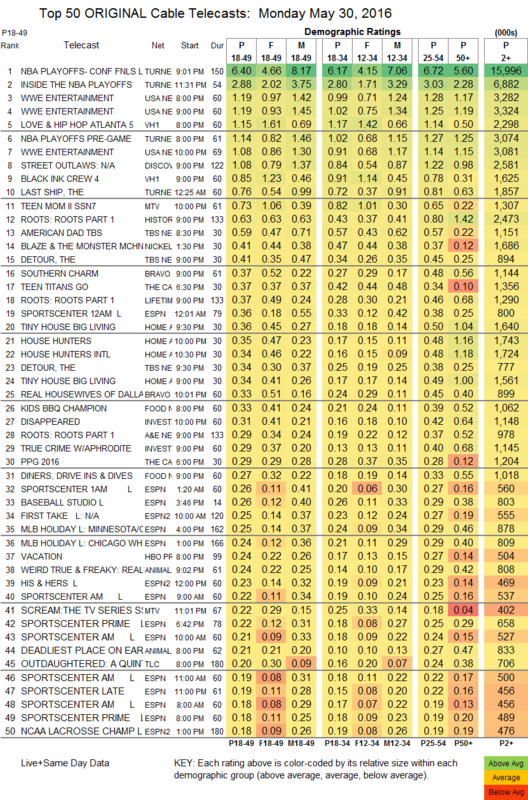 On Food Network, KIDS BBQ CHAMPIONSHIP was at 0.33, and DINERS, DRIVE-INS & DIVES was at 0.27. A 3-hour OUTDAUGHTERED on TLC was at 0.20. 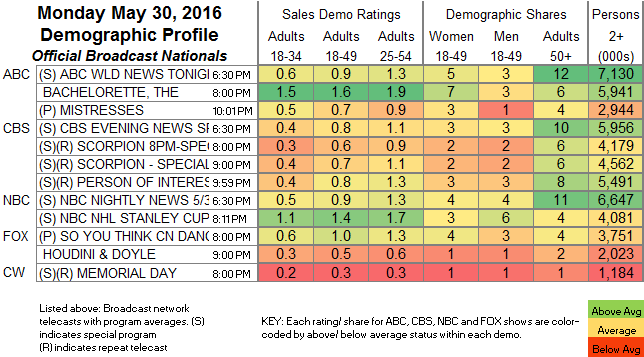 Freeform’s MONICA THE MEDIUM had a good night by its standards, up a big 0.08 to 0.14. AMC’s TURN lost 0.02 to 0.13. On Syfy, 12 MONKEYS was up 0.04 to 0.12, and HUNTERS, pushed to a midnight timeslot, fell off the chart and down 0.02 to 0.05/168K. HBO’s AFTER THE THRONES dropped 0.03 to 0.08.